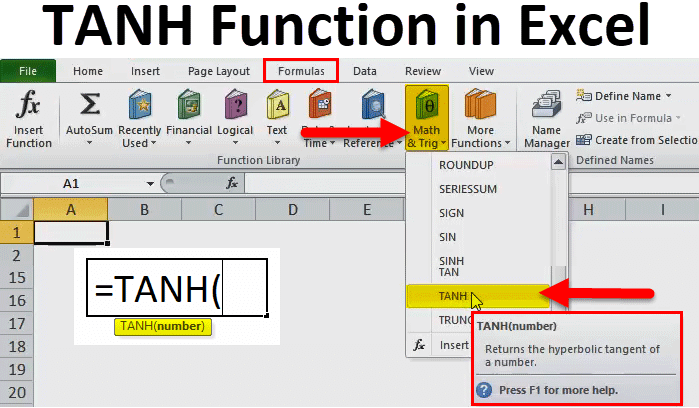 TANH Function (Formula, Examples) | How to use TANH in Excel? 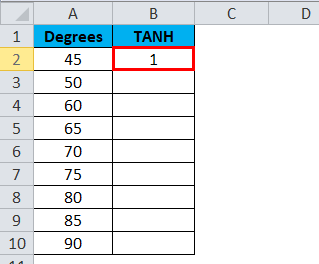 How to Use TANH in Excel? Excel is full of formulas. I have not met a person who knows all the formulas in excel. The reason behind this is we do not get to see much of some of the excel function too often. It is one of those function many of Excel users do not have an exposure to. Especially if you are working in corporate companies, the need to TANH probably never arises unless you are working with an economics background. In this article, we will discuss the details of TANH. As an MS Excel Consultant, it is almost an inevitable thing to learn all the aspects of MS Excel whether you like it or not or else you will fade away very soon in front of others. Especially learning mathematical & trigonometry functions requires a lot of mathematics background. If you are from non-mathematical background then I might take some time to get used to it. However, do not forget nothing is impossible in this world. It is one of those mathematical & trigonometry functions in excel. It is treated as a mathematical function, which involves a trigonometric process. It returns the hyperbolic tangent Function of a given number. It returns value for any real number supplied by the user. Now you must be wondering what is this Hyperbolic Tangent Function is all about. Even I too have wondered about this when I first get to see this. Nothing to worry I will explain you the basic of the hyperbolic tangent function. A function of an angle expressed as a relationship between the distances from a point of a hyperbola to the origin and to the radius of the circle as hyperbolic sinh and hyperbolic cosh and it is a combination of an exponential function. Hyperbolic Functions are Sinh, Cosh, Tanh, Coth, Sech, and Cosech. All are related to each other one or other way around. In this article, we are discussing TANH. Let us concentrate on this only as of now. The formula to find the hyperbolic tangent function is. In a scientific calculator, also we can easily find the tangent of a given number. Below image shows the tangent of a number 30. It includes only one parameter though and that is the number you want to find the tangent. Number: The number you want to get the hyperbolic tangent number. The number is considered as the angle to radians. 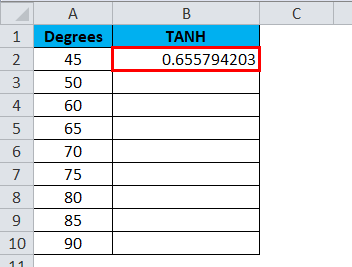 How to Use TANH Function in Excel? 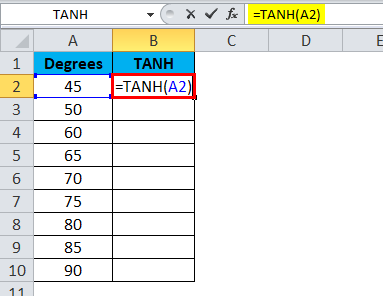 TANH in Excel is very simple and easy to use. Let understand the working of its function by some example. 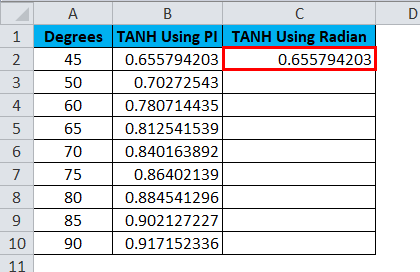 Before we head into this example lets understand some of the basic formulas in excel and those are PI & Radians. PI (π): We all must have studied PI in our school classrooms. The value of pi is 3.14159 or 22/7. 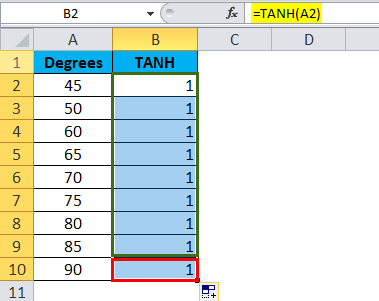 In excel there is an inbuilt function called PI which returns exactly the same value. Radians: It is the SI unit of measuring any angles of the circle. One radian is any created from the center of the circle by an arc where the length is equal to the radius of the circle. 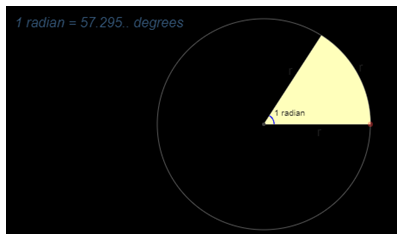 One Radian is equal to 57.2957795 degrees. 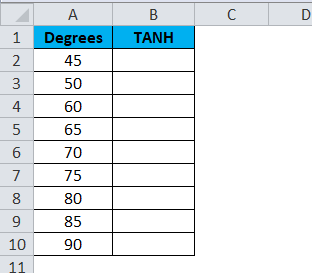 Look at the below table you have a degree in column A and you need to get the tangent of the below list. Apply the formula to get the tangent of an angle. Look at the result; it is not the correct value it is showing. If the supplied number is in degrees we need to multiply it by PI ()/180 that converts the result into radians. 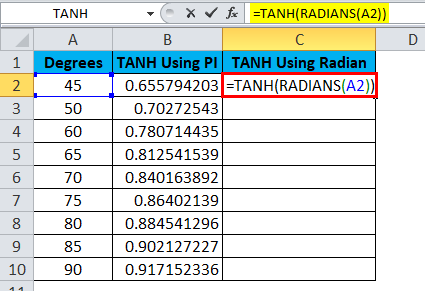 Instead, of using PI () / 180 we can use Radian formula inside the TANH formula. Here is the example of that. Wow! We got the same result as the previous one. 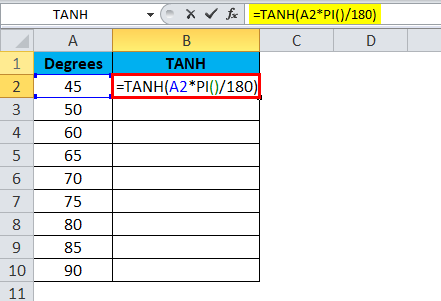 Therefore, PI () /180 is equal to the value of Radians in excel. Firstly, understand the basics of a hyperbola and other trigonometry concepts. Without understanding those functions it is very difficult to understand any trigonometry functions in excel. You should be strong in these concepts. 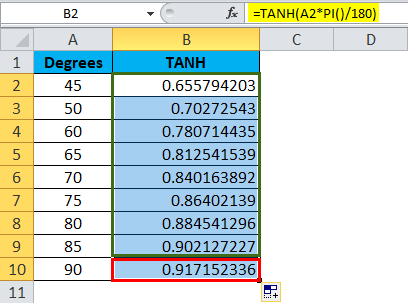 Try to solve the problems manually and then learn this function in excel. Along with these concepts of radius, radians, PI etc… are very important in trigonometry. If the supplied number is not numeric then we will get the error type as #VALUE! 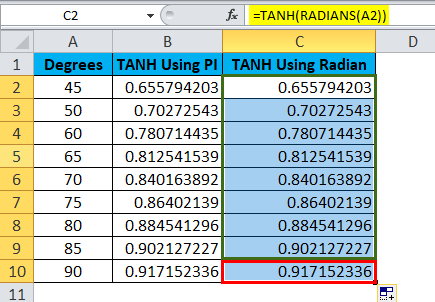 If we want to convert the radians into degrees then we can use the excel built-in function called Degrees. An important thing in this function is we wish to get the results as tangents.